The Asset Management Tool is used to keep track of all the assets in the company. The Tool is designed to keep a database for assets to record purchase price, manufacturer, make, model, serial number, insurance information, warranty information, notes, check in check out, and service history. The Asset Manager gives access to the detailed asset records, and a high level view of the asset name, site location, manufacturer make and model, next service, insurance and warranty expiry dates. The view asset screen gives all recorded information about the asset along with the check in and check out history and the Asset Servicing history. 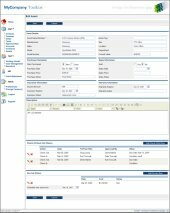 The edit screen appears with fields such as manufacturer, purchase price, and other data fields that make it possible to manage the company assets.